Silver Club in service on the North Shore Scenic Railroad in Duluth, MN. The newest car in service on the North Shore Scenic Railroad, which operates between Duluth and Two Harbors, Minnesota, is CB&Q dorm-buffet-lounge car No. 250, the Silver Club. Built for the new California Zephyr by Budd in November of 1948, the car has had quite a journey before ending up on the shores of Lake Superior. The car passed into BN ownership upon the merger before going to Amtrak in 1971. It lasted on Amtrak for about 10 years before being put into storage. Silver Club went into private ownership in 1984 and passed through multiple owners before ending up in Fargo, North Dakota, in the collection of Dirk Lenthe in 1995. Plans to restore the car had come and gone and by the time it reached North Dakota, the interior was a mess. By about 2012, the windows on the car had been replaced, along with the wheelsets, but not much work had been done on the interior. It was at this time that plans were put into motion to donate the Silver Club to the Lake Superior Railroad Museum for use on the North Shore Scenic Railroad. The first stop on the trip to Duluth was to the Friends of the 261 shop at Minneapolis Junction in Minneapolis in 2016. It was here that most of the restoration would take place. The car was stripped down to the bare walls in order to remove asbestos and facilitate work on the HVAC, plumbing and electrical systems. The dormitory area was removed and made into a lounge featuring wood grained walls. The built in seating in the coffee shop and lounge, except for the two booths at the end of the car adjacent to the restrooms, had already been removed prior to the car being donated to the museum. Wood grained walls were also installed in these areas as well. In the dome, the seats were reinstalled in facing pairs with tables in between. In the lounge area underneath the dome, a large photo of the Duluth Aerial Lift Bridge and harbor area was installed, reminiscent of the cable car scene which was located on the opposite side of that wall. The buffet/bar area is still in place, but have not been restored at this time and are closed off. Also yet to be restored are the restrooms at the lounge end of the car and the steward’s and Zephyrette’s compartments at the dormitory end of the car. To complete the exterior of the car, new letterboards and nameplates were made and affixed to the car. The letterboards currently read “Burlington,” but there are plans to make new letterboards with “Duluth Zephyr” on one side and “California Zephyr” on the other or something to that effect. 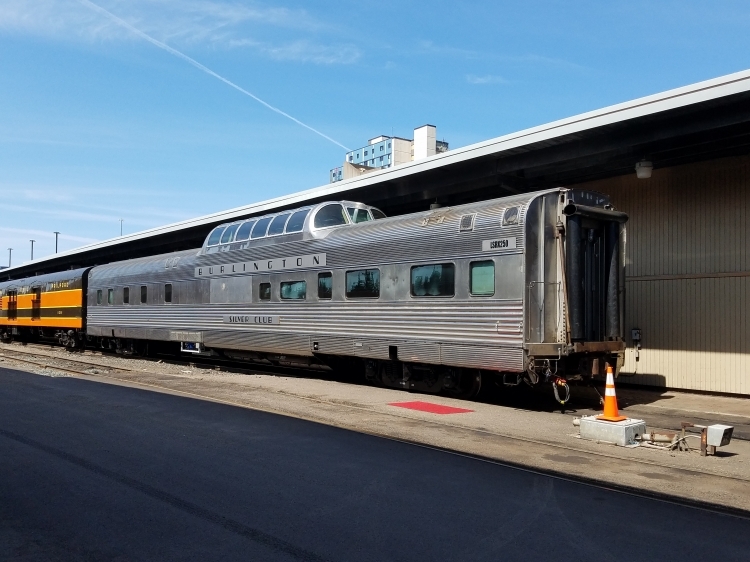 With the majority of the restoration work completed, the Silver Club was pressed into service as part of the Milwaukee Road No. 261’s early June 2017 excursions on the Red River Valley & Western Railroad in southeastern North Dakota for the RRV&W’s 30th Anniversary. Needless to say, the car was a hit. Silver Club arrived in Duluth in mid-June 2017 and was placed into service on the North Shore Scenic Railroad’s daily Duluth Zephyr excursions. Also in service on the NSSR during the 2017 operating season was CB&Q Vista-Dome No. 558, Stampede Pass, off the Northern Pacific North Coast Limited, giving the NSSR two Q dome cars for passenger use. After being in service for about a month and half, the Silver Club was sent back to North Dakota in mid-August to the Northern Plains Railroad. NPR was celebrating 20 years of service on their ex-SOO Wheat Line and what better way is there to do so than with an excursion train over the line with a dome car? After four days of excursions on the plains of eastern North Dakota, the Silver Club returned to Duluth to finish out the remainder of the 2017 operating season on the NSSR. As thanks for letting them use the Silver Club on their celebration excursions, the Northern Plains Railroad is paying for the restoration of the restrooms. The final piece of restoration on the Silver Club is the steward’s and Zephyrette’s compartments. The Lake Superior Railroad Museum has reached out to the BRHS and its members to spearhead the final push for donations to finish the compartments. It is expected to take roughly $5,000-$8,000 to restore these compartments back to their original appearance. These funds will be used for painting, upholstery and flooring work. Since this is car #250, the BRHS has gotten the ball rolling with a donation of $250 and will be matching the first $750 in member donations, for a potential total of $1,000 from the Society itself. If you would like to donate, you may send a check made out to BRHS with “Silver Club” on the memo line to BRHS Silver Club, P.O. Box 31, Superior, WI, 54880-0031. Restoration work has amounted to almost a quarter of a million dollars to this point and the finish line is in sight. Make plans to visit Duluth and the North Shore Scenic Railroad soon and ride the Silver Club.